Do you like cream puffs? Until a few months ago, cream puffs didn’t interest me much. That is, until I tasted THESE cream puffs. My mom’s good friend, Filomena, created the filling for this heavenly dessert. You see, cream puffs are all about the filling! 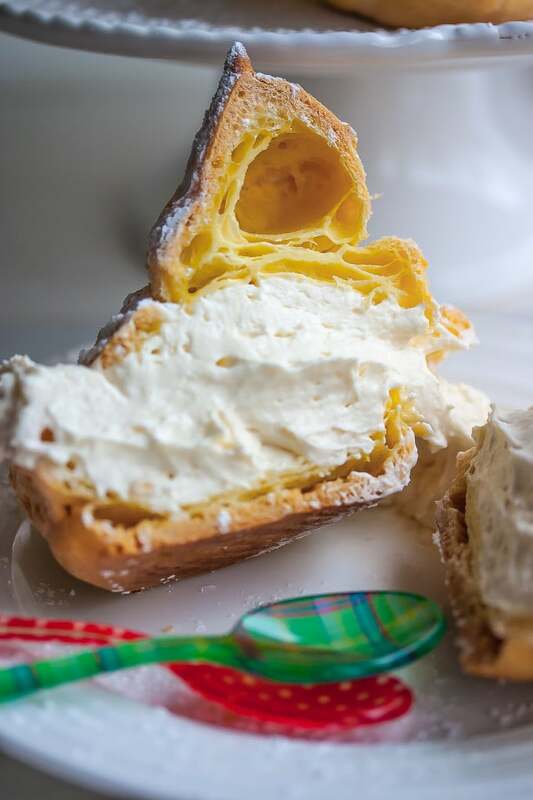 The shell is your standard cream puff shell, and just about every recipe you’ll see for the shells is the same. But what goes on the inside makes the world of difference. I’ve grown up eating them with pastry cream in the middle – an egg-based cream. They were ooookay, but nothing spectacular in my book anyway. The inside of these are filled with a sweetened mixture of whipped cream and ricotta cheese. Oh. So. Good. I’ve discovered an amazing source for ricotta called Fierro and Sons, located in Wilmington DE. I asked them if they shipped their product and the good news is that they do. If you are a ricotta lover, please consider giving them a call. They will recommend one of their products based on your desired end use (impastata for canoli, whole milk for lasagne or these cream puffs, etc). Ensure your puffs are golden brown before turning off oven or they will deflate/fall! When they are finished baking, turn off oven and let the puffs cool for 5 to 10 minutes with the oven door ajar. In a medium size bowl, combine 1 cup heavy cream with 1 teaspoon vanilla, 1/4 teaspoon cream of tarter, 1 cup powdered sugar and whip until soft peaks form. Use high quality ricotta that is not watery or grainy. The supermarket variety cannot be used unless it is dried out (drain over cheese cloth in refrigerator overnight or up to 1 day). As an example, ricotta is thick enough if it sticks to the spoon when the spoon is inverted and does not drop off. You can drain the ricotta overnight in a fine mesh strainer or cheesecloth placed on top of bowl to catch excess liquid. The flavor of this cream is out of this world!!! Hands down one of my favorite desserts. But it does make enough for two batches. Which is ok. I use the rest tondip fruit or freeze for another day. I do find the cream not quite thick enough for filling the creme puffs. I whip up 1 1/2 cups of the heavy cream. That seemed to help this time. Thanks for the awesome recipe and great instructions! How large are the puffs if you do 12? Just making for 6 and wonder if I should 1/2 the recipe. 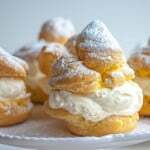 Wanting to serve 2/3 SMALL puffs per serving, like profiteroles. Looking forward to making!!! Do you mean in place of the ricotta? I’ve never tried it but I don’t see why not? You might have to adjust the whipped cream portion to get the desired consistency because I think mascarpone is a bit stiffer than most ricotta cheeses. 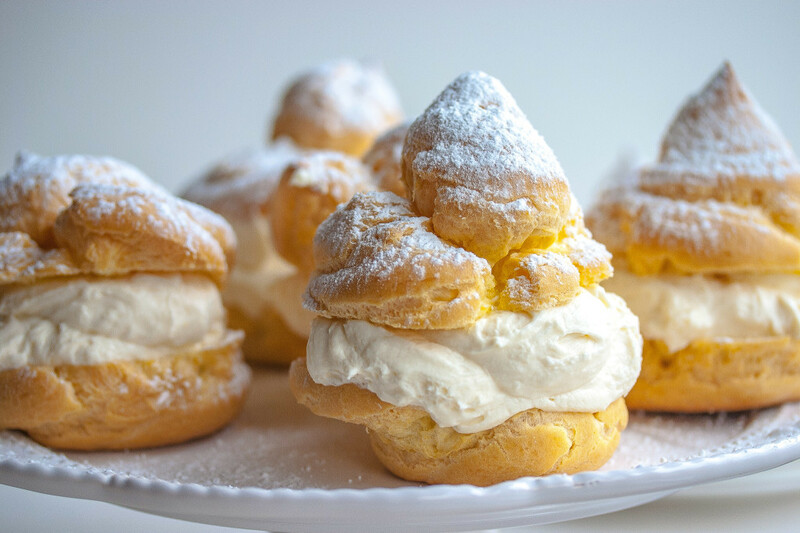 These cream puffs are amazing. So light and delicate delicious. The filling made enough for 1 1/2 batches of dough. You had me at Utica!! My mom is from Remsen. But to return to your lovely recipe, it’s just like Nonna’s. Thanks for posting. awesome recipe. using it it a stout cake. I will follow up with how it turns out. I have been searching, and searching, and SEARCHING for a stand-up cream filling like the one I used to get in the Cream Horns my parents would get us at a downtown bakery. It wasn’t plain, sweetened whipped cream, nor any of the other cream and custard fillings out there that are tied to Cream Horns or Puffs. I am so ECSTATIC to find your recipe!! !… to bad it’s 9 PM and I don’t have cream or I’d be down in the kitchen instead of writing this comment! Heat milk to 180 degrees; remove from heat and add the vinegar. Stir for a bit (until you see the curds start developing), then add the salt. Cover with a tea towel and let it sit at room temperature for two hours. Line a large strainer or colander with a triple layer of cheese cloth rinsed in cool water and place the strainer/colander over a bowl to catch the whey (you can use the whey to cook pasta or give to your pets). Pour the contents of the pot into the cheese cloth/strainer. Gather the edges of the cloth together over the top of the cheese. Let it drain until you get the consistency you need for whatever you’re making. *TIP* – I keep about a half cup of the whey just in case I forget about the cheese and it gets to dry; just add a tablespoon at a time until you reach the desired consistency. I haven’t purchase ricotta since I found this recipe! Hands-down, the BEST ricotta you’ve ever had, guaranteed!